LI's Adorable Adoptables: Meet Binky, Dixie, Larry, Sonja & Chunk! It’s my pleasure to introduce you to Binky, Dixie, Larry, Sonja & Chunk! LI's Adorable Adoptables is a weekly column by Allison Matos, a lifelong Long Island resident who has been advocating animal adoption since 2012. Allison's weekly posts highlight local animals in need of adoption, and cover general animal welfare topics as well. The beautiful and sweet Himalayan girl pictured above is none other than Binky. Binky was rescued after her owner died and she found herself homeless. Binky is an adorably affectionate lady who adores being petted and loved. Estimated to have been born in 2010, all she needs is YOU to give a happy ending to her story! Binky is located at Last Hope Animal Rescue’s satellite center at PetSmart Huntington Station. For more information, check out her webpage. Last Hope Animal Rescue isn’t whistling Dixie; instead, they’re looking for a home for her. Dixie is an adorable Basset mix who comes to Long Island from a Kentucky Shelter. She’s between 1 and 2 years old, still puppyish, and a little puppy mouthy. Dixie has done well at Last Hope off site adoption events, and has the potential to be a great family dog, if handled with consistency and “doggy direction.” For more information on how to adopt Dixie, check out her webpage. Sweetest Dog Rescue has three great pooches available for adoption this week! Read all about Larry, Sonja and Chuck, then contact on email for adoption information. 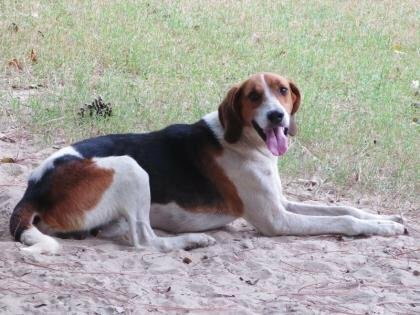 Larry is an awesome 2 year old tree walking coonhound, and he's absolutely gorgeous! He would be the perfect companion for a jogger/walker. He is good with other dogs, loves humans, is very cat curious, and loves to snuggle up at night and watch tv. Honestly, who could ask for more from a best friend? Sonja is an 8 month old black mouth cur mix female. She's good with people and other dogs (but not so much with cats). Sonja is a great girl who would do best in a home with people who are dog savvy. She is excellent on long walks and makes the perfect co-pilot in the car. All the more reason to bring home Sonja today! Chuck is the most adorable meatball I’ve ever laid eyes on! This 8 year old male puggle mix is a mush with other dogs, is good with cats and is great with humans! Chuck would do best in a home with older children which is perfect since he is a great couch potato companion and loves to go on drives and walks! Another awesome late night companion who would love nothing more than to snuggle on the couch and watch tv with his humans. North Shore Animal League's Four Legged Friends: Meet Martha, Cynthia, Josie, and Thurman! Subject: LongIsland.com - Your Name sent you Article details of "LI's Adorable Adoptables: Meet Binky, Dixie, Larry, Sonja & Chunk!"